PIC16F873-20/SP Microchip Flash Microcontroller 28-pin dual in line - 22 port Input / Output - 4k Fl..
A newer device is available. Please consider the PIC16F887. This powerful (200 nanosecond instructio.. This microcontroller has nanoWatt Technology, which features six enhanced power-managed "softwa..
PIC18F2420-I / SO Microchip Flash Microcontroller SMD 28 pin - 16k Flash program memory - 25 I / O p.. 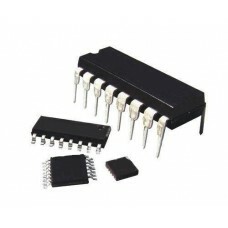 Ideal for low power (nanoWatt) and connectivity applications that benefit from the availability of t..
PIC18F2620-E/SO Microcontroller Microchip SMD 28 PIN Flash Memory 32k 25 port input/outpu..
PIC18F2620-I/SO Microcontroller Microchip SMD 28 PIN Flash Memory 32k - 25 port input/out..
PIC18F2620-I/SP Microcontroller Microchip 28 PIN DIP Flash Memory 32k - 25 port input/output - .. This powerful 10 MIPS (100 nanosecond instruction execution) yet easy-to-program (only 77 single wor..
PIC18F458-I / P Microchip Flash Microcontroller 40-pin DIP - Flash program memory 32k. More info ..
Microcontroller Microchip has 36 port Input / Output, 64 KB Flash program memory, 3936 bytes SRAM me.. Ideal for large low power (nanoWatt) and connectivity applications that benefit from the availabilit..
PIC24 16-bit Microcontroller, 64 KB Flash Memory, 8 KB RAM, and Advanced Peripherals, 64 Pin Package..